Magic Leap may still keep its cards close to the chest, but we've finally caught another slight glimpse at what the elusive startup has up its sleeve. An application filed by the company to the US Patent and Trademark Office shows design renderings for what could be Magic Leap's augmented reality display - a headset granting users computer-overlaid graphics, as teased two months ago during the company's "A New Morning" demonstration. 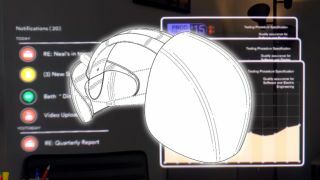 The designs shown in the patent feature an over-the-head enclosure that covers the eyes, giving off what we can only describe as a "near-future security guard from Mirror's Edge" kind of look. While the product is going through patent approval, Magic Leap's current concept is far from what the consumer version of the headset will look like. That said, any details are a revelation when discussing a company as tight-lipped as Magic Leap, so we'll take what we can get. If nothing else, we now know the device is closer to the Oculus Rift or HTC Vive in design than, say, Google Glass. From there, we can begin solving the myriad of remaining mysteries surrounding the device, such as how its unique style of projecting holograms to the human eye works in the first place.